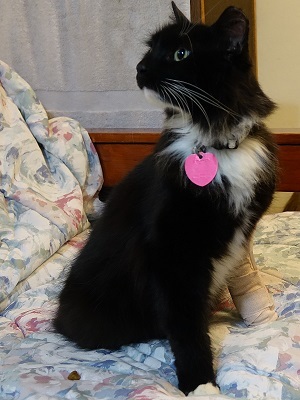 "bobo_flier.htm" - "Bobo" a medium haired tux neutered male adult. "Bobo" a medium haired tux neutered male adult. 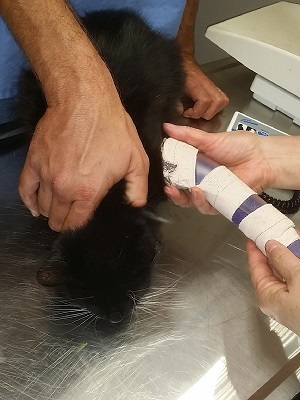 Bobo getting his first splint, November 3, 2016. Bobo after getting his second splint on November 21, 2016. Bobo using his second splint, November 23, 2016. X-ray of Bobo's leg, October 25, 2016. X-ray of Bobo's leg, October 25, 2016. X-ray of Bobo's leg, December 16, 2016. Bobo is sweetheart — calm, affectionate, well behaved, and litter box trained. He is an ear-tipped community cat who was found limping around on Merritt Island. A good samaritan took him to a cat rescue. 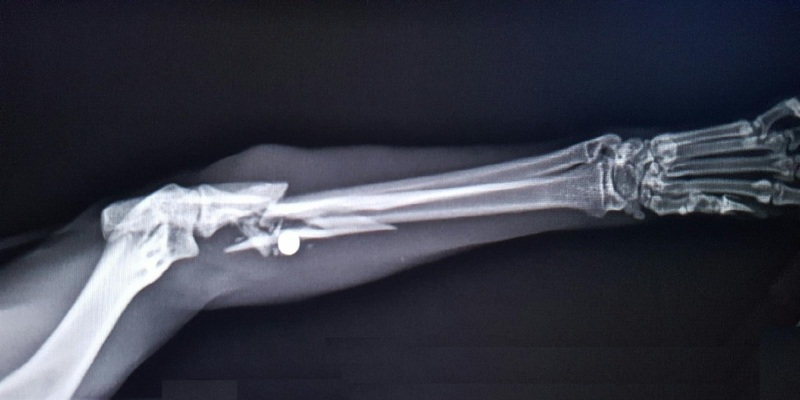 A trip to an animal hospital for X-rays determined he had a broken front leg, with a BB lodged in the break. The first animal hospital suggested amputation might be neccessary. 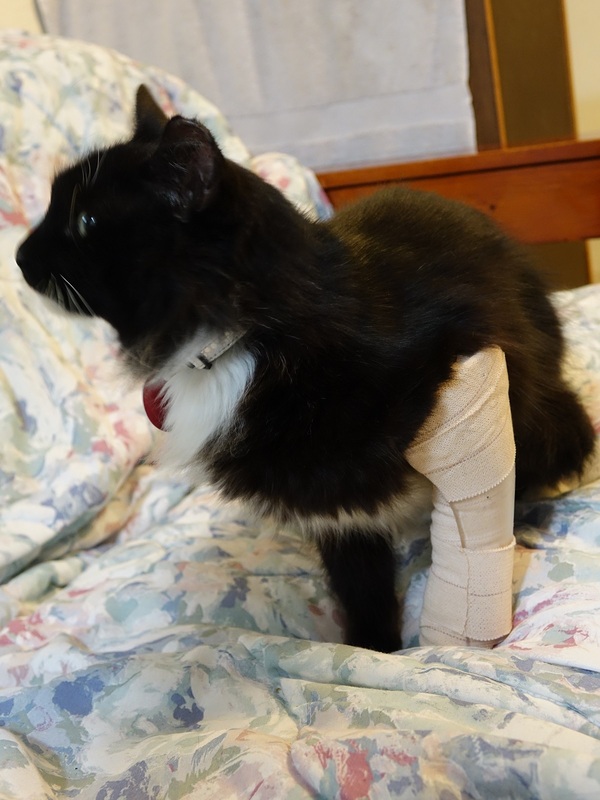 Based on a second opinion from another clinic, it was decided to try to save Bobo's leg. As of mid December 2016, amputation seems extremely unlikely. Bobo used his injured leg with a splint on it (see Dec. 2nd, below). He even tried to remove the first splint by himself a couple days ahead of schedule. Now that his broken leg is healed, Bobo is looking for a new home. Bobo tested negative for feline leukemia (FeLV) and feline immunodeficiency virus (FIV). He is up to date on vaccinations, and has a micro-chip. He has also been treated recently for fleas and other parasites. For more info contact Leon, (321)301-5444, <SailinCat@SailinCat.com>. Chip #: 985 112 008 047 932 Dr. Connie, Dec. 5, 2016, HomeAgain.